Meggan Dawson-Farrell says a recent injury setback was never going to get in the way of her dream of securing a medal at Glasgow 2014. 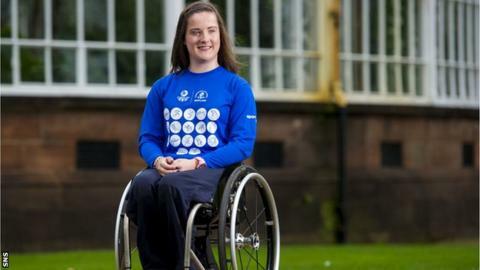 The Scot will compete in the Commonwealth Games Para-Sports programme, racing in the 1500m wheelchair event. And while her preparations have been anything but plain sailing, she is now back on track for glory. "Nothing seems to go to plan for me," said the 21-year-old. "I got a shoulder injury, got back from that, then I was out training with my dad and got an injury to my forearm and wrist," she added. "I put my arm through my chair, in my wheel, and I did a full rotation with it stuck. I eventually got it out but thought I had broke my arm because I was in so much pain and couldn't move it. Luckily it was just ligament damage. "Then recently I had a kidney infection, but I'm back from that. "I'm hoping that's me had my problems and I can now concentrate on training and racing for the Games." This will be Dawson-Farrell's first Commonwealth Games. And when asked what kept her spirits up after the injury, she said: "Knowing that once I'm fit again I'm getting back to what I love doing. Knowing that I get so much enjoyment out of it, and knowing the Games are coming up." The Scot is considered a major medal contender and she is determined to secure a place on the podium. "At first, as a family, we were hoping that I would make a final. Now we're hoping that I can get a medal. "It would be lovely to get a medal at a home Games, and we're going for it, but if not I'll have done what I could on the day. "It's a home crowd and it's the biggest event I'll have done to date, so just having that will be an experience in itself."